Looking for information about the weather Naples Italy? Here you will find todays current weather in Naples and the Naples Italy weather forecast for the next 5, 10 and 15 days. Plus the maximum and minimum temperatures in the city for each calendar month and the likelihood of rainfall throughout the year. The forecasts for each day for this cosmopolitan metropolis and one of the oldest cities in the world includes details of wind direction and speed, the probability of rain, snow and thunderstorms, the maximum hours of daylight, the UV index... and more. And there are hour by hour weather summaries, severe weather predictions... in fact everything you need to plan ahead. 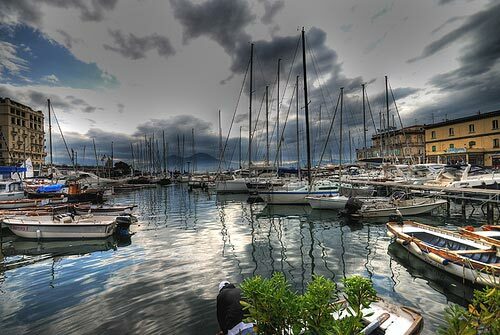 The great photograph above that has captured the movement of the clouds over the harbour at Maschio Angioino (Castel Nuovo) in May is by kind permission of Franceso Sgroi. If you click on the top right-hand corner "All 15 Days" link it will take you directly to the forecast information for the UNESCO World Heritage Site city centre, the Bay and surrounding area for the next 1 to 5 days, 6 to 10 days, 11 to 15 days, all 15 days, or just the weekends. The climate in Naples - the historic city and the Gulf of Naples - is a typical Mediterranean one, attracting many visitors for its warm to hot, dry summers and mild, wet winters. All of the best rated hotels, apartments, vacation rentals and bed and breakfast accommodation in Naples Italy all in one place: read the reviews from fantastic to terrible for over four hundred and seventy places to stay. Quick links from the weather Naples Italy to Florence, Milan (Milano), Pisa, Rome (Roma), Siena, Turin (Torino), Verona and Venice (Venezia). Find out more about Maremma for your next trip to Italy. It is a stunning land of oak and Mediterranean machia covered hills home to wild boars, deer and wolves; of pink flamingo lagoons and beautiful beaches within protected parks and nature reserves... And a place where the famous Italian dolce vita is found in simple everyday life.